accessories. 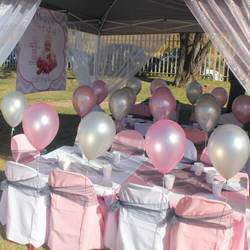 Kiddies tables, chairs, chair-covers and tablecloths in colour which suites your theme, Happy Birthday banner, photoboards. Anything from boxes, buckets, organza bags, themed loot bags, toys, sweets and novelties. Add the magic of balloons for colour and fun. Choose one of our castles or slides to be delivered. Personalize your invites and say a special thanks or just add your theme to your party box. Stunning looking, any theme you like. Scan Cakes, 2D and 3D cakes available. Cone and biscuit creations, luncheon platters sweet and savory. - Photography and make stunning DVD slideshows of your photos. 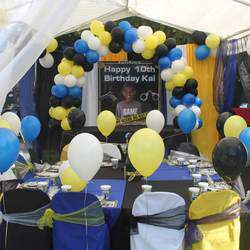 - Disco for all type of functions. 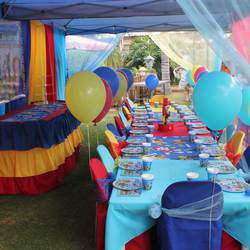 - We also do kitchen tea, Stork parties, 16th, 18th, 21st and any Themed parties.